When it's fifty-two degrees, and the sun is out and I'm wearing boots and my wool coat, I think, "Wow, it's so warm and nice and beautiful out!" I drive with the windows down just a bit, and I decide that before I go out to dinner, since it's so warm and nice and beautiful, that I'll change into heels and a lighter jacket. Then I realize that 52° is only warm when the sun is out and I'm wearing boots and a wool coat. 52 is at least partially on the way to spring! I love the jeans! Love this look! Simple and still totally polished! 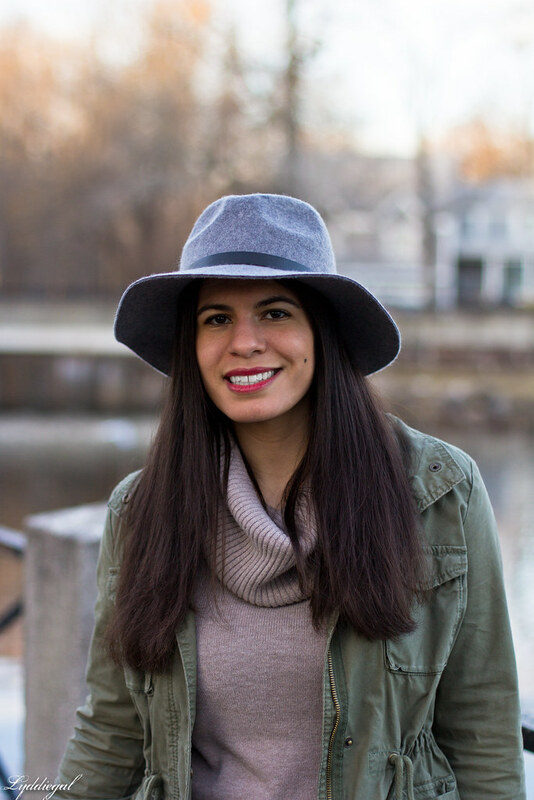 Love your hat! I'm in a sunny 13 right now... still kind cold for me. I guess for you its better than it has been before - I really like how well all goes together and specially the hat. Love this look! The army jacket is amazing! Yep! Been there all right! And it's all so relative because 52 in summer is freezing--in February it's practically shorts weather! I want that jacket! I have a military vest, but totes need a jacket! I had no idea 52 could be so warm? I guess it depends on where you are. Lovely outfit, especially love the leopard clutch. I'm glad it is getting a little warmer for you! I really like that jacket and leopard clutch. I hope your week is going well! 52 in California, we would be in warm park jackets, beanie and ugg boots. Pretty look! Love that turtleneck so much. This is a great look! Loving turtlenecks at the moment! And this one is in the prettiest colour! Over here in Australia it's just getting into winter so I'm pretty excited to go shopping for a few winter pieces! Lol that's funny because in Florida at 52 we don't wear coat and just freak out about how cold it is. Love these classic pieces. Love the pretty color palette you have going on here. This weekend would have been perfect if the wind wasn't around! You look so chic and polished. Great color combination! I exactly know what you mean about the weather - giggle! Also, your jacket totally tickles my fancy:) Kisses, darling. 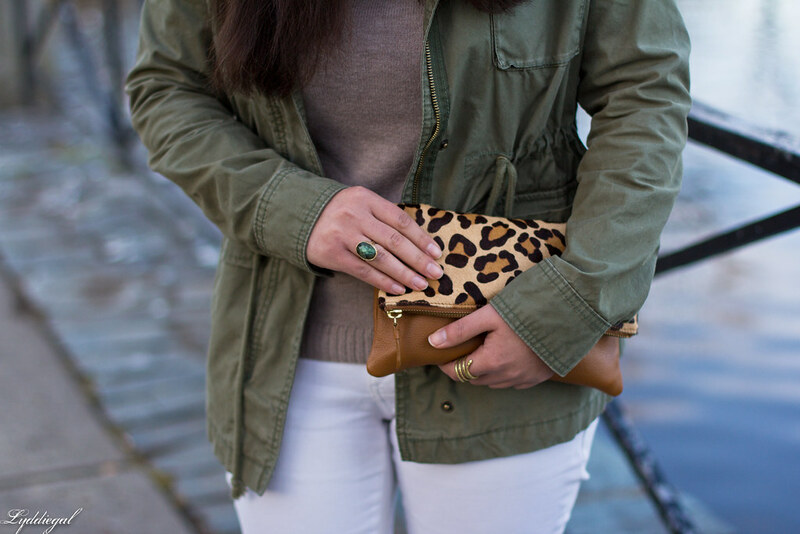 Oh I love that little leopard clutch -- so timeless with the khaki jacket! The 50's definitely feel like full-blown summer after winter, haha. I know what you mean, girlfriend. 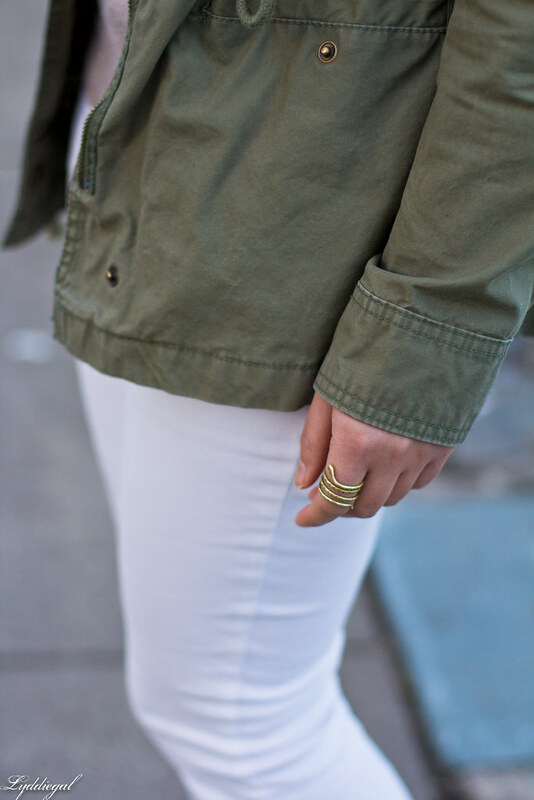 I love this jacket- so cool + many ways to style. Awesome piece! This made me laugh because I totally do that too--I forget that what it feels like at night is a lot different than during the day! 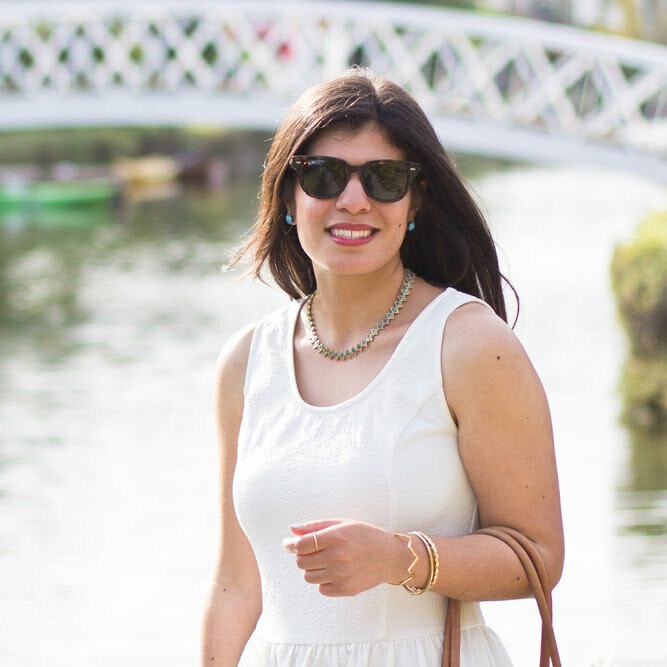 I love how you styled your white jeans here--I need to pull mine out! Another one of my favorite looks -- so versatile. PS: the weather?! Crazy. It's 80 here and I'm sweating. Crazy. I always forget how much colder night gets. I love the pop of leopard in the clutch. love this look! Such a great color combo! Can't wait for warmer temperatures. Ha ha, I couldn't help but laugh at this because I completely know what you mean. 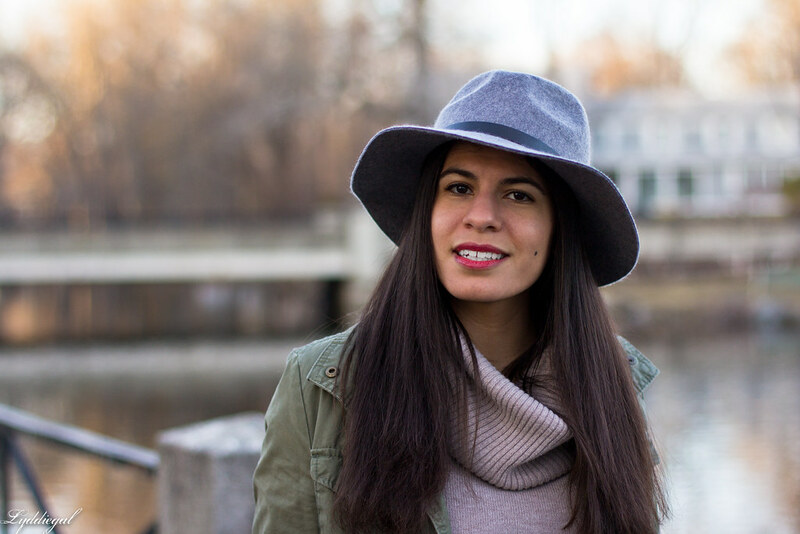 I like to give myself the illusion of warmth through wool coats and heavy scarves; my friends sometimes laugh when I am dressed for January in March but at least then I feel like spring is coming even if it isn't ;) This turtleneck is always one of my favourite pieces on you and it looks made to go with white jeans. And leopard print, too, come to that! 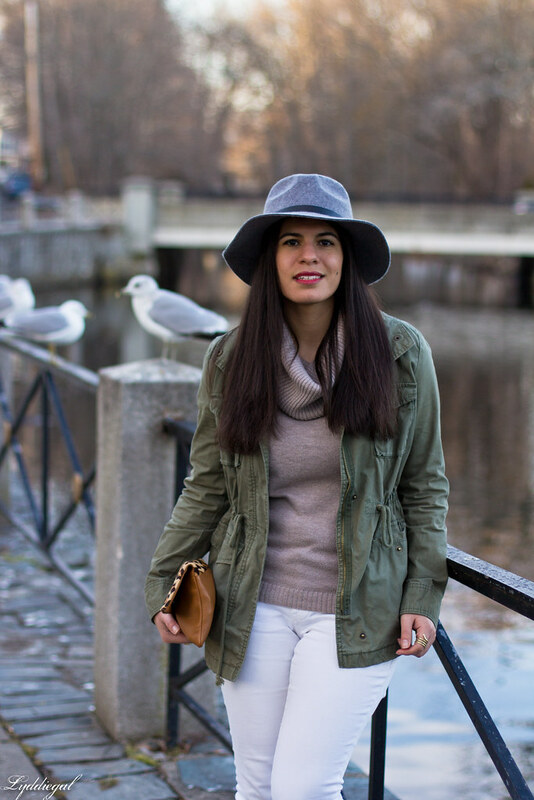 Love this look, especially with the hat and utility jacket. What a great pair up! I feel the same way about 50 degrees... in the shade it can be quite chilly! I'm in boots until it's at least the high 50s. I think it's a weird quirk, but I don't like the tops of my feet getting cold. Haha..if it was 52 degrees here I'd pull out all my coats, sweaters and boots! I know you wish it was warmer but I'm jealous of all your layers! Love the hat! 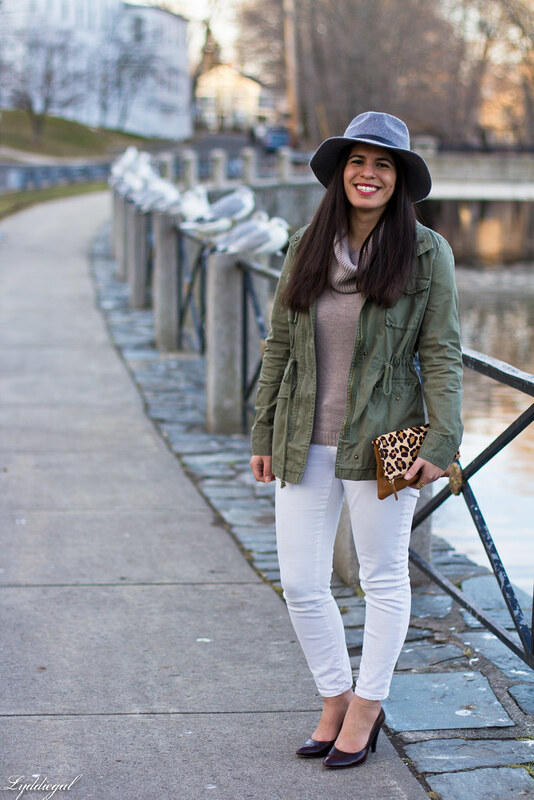 I'm loving the neutral mix of gray, white, camel, and army green! Very cute!